A car bomb near the city of Basra in southern Iraq has killed 10 people and wounded many others, local police say. The blast happened near a bus station in Garmat Ali, 18km (11 miles) north of Basra. Earlier, another bomb to the west of the city wounded two people. Basra is Iraq's main port and has a predominantly Shia Muslim population. The bombing come days before the 10th anniversary of the US-led invasion of Iraq, when Basra was occupied by UK forces. Attacks in Basra are relatively rare compared to other regions of Iraq. Violence in central and western Iraq has increased in recent weeks amid continuing protests by members of the Sunni minority against the Shia-led government. Sunni militants - some with links to Al Qaeda - often target government officials and buildings, as well as members of the Shia majority. 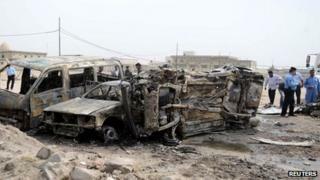 On Thursday more than 20 people were killed in a series of bomb and gun attacks in the capital Baghdad.